Formulation: Liquid. In 10mM sodium phosphate, pH 7.2. 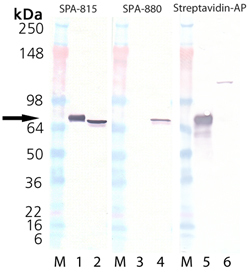 SDS-PAGE analysis: Lane 1: MW Marker, Lane 2: 1µg, Lane 3: 2µg, Lane 4: 5µg HSC70/HSP73 (bovine), (recombinant) (biotin conjugate). 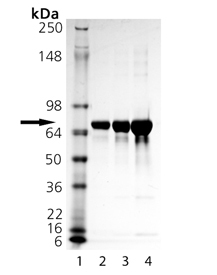 Western Blot Analysis: Lane M: MW Marker, Lane 1, 3 & 5: HSC70/HSP73 (bovine), (recombinant) (biotin conjugate). Lane 2 & 6: HeLa lysate (Prod no. ADI-LYC-HL100), Lane 4: E. coli lysate. Left: probed with Hsc70 mAb (Prod. no. ADI-SPA-815); Center: probed with DnaK mAb (Prod. no. ADI-SPA-880); Right: probed with Streptavidin-AP conjugate.